Each year, hearing loss and other hearing deficiencies affect millions of people in virtually all demographic groups. For children, hearing deficiencies can lead to learning disorders and social struggles and can also be indicative of larger developmental issues. For adults and seniors, hearing loss can cause severe complications in the workplace and can lead to social isolation and depression if not diagnosed and treated. 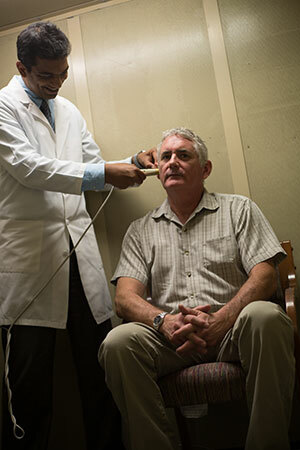 The first step in diagnosis is a hearing test (often called an audiology test or an audiometric) to identify the extent and type of hearing loss. At Hearing Solution Center, our Charlotte, NC audiologists perform hearing tests for patients of all ages across the region. Read on to learn more about hearing tests below, and take the first step to overcoming your hearing issues by calling our center at (704) 912-4422 today! A hearing test is a short diagnostic test administered as part of an overall hearing exam to determine how well a person can hear. Also called audiology tests or audiometrics, hearing tests measure how well sound reaches the brain and thus typically involve patient response for an effective diagnosis to be made. The ear has multiple parts that make the hearing process work, including the ear canal, eardrum, cochlea, and other components. Different parts of a hearing test can determine which of these parts is likely causing the hearing issue and can pave the way for treatment going forward. Below, we’ve provided information on the different types of hearing tests we administer here at Hearing Solution Center. The whispered speech test is typically used as a preliminary hearing test to determine if the patient is experiencing any hearing impairment at all. It is preferable for the patient to bring a family member to perform this test, as their voice is more familiar to them, but if a family member is unavailable it will be performed by the audiologist. During the whispered speech test, an audiologist will speak a series of words, asking you to repeat them as you hear them. An audiometry test uses a special machine called an audiometer to play series of tones through headphones to a patient. The tones vary in pitch and loudness. By observing which tones you can and can’t hear, audiologists can often determine which type of hearing impairment you may be experiencing. Speech recognition tests test how well an individual can hear and understand normal speech. They work the same way as whispered speech tests, except the testing audiologist speaks at a normal volume and pitch but compensates for the drop in hearing with the help of an audiometer. Other tests used are tuning fork tests, oto acoustic emissions (OAE) tests, and auditory brain stem response (ABR) tests. At Hearing Solution Center, we prioritize the comfort of our patients and work diligently to provide them with best hearing solutions North Carolina has to offer. When you schedule a hearing test with us, you’ll be pleased to find that test itself has absolutely no associated pain or discomfort and is typically completed well within an hour. To learn more, and to schedule a hearing test, call either our Charlotte, NC center at (704) 912-4422 or our Rock Hill, SC center at (803) 232-5997!